..Dylan draws all the power and excitement that has been created by the tour and the two new albums, and unleashes it in a fury into the wide-eyed Carolina crowd. Dylan rants and raves, and spits the vocals out with venom. Every word rings true as if written in his soul. Possibly the finest performance of the extensive tour. The sound quality is nice as well. Rich, bright, and full. Of course, it falls well below the quality of ‘Budokan’; but the fiery performance leaves the official release in ashes. ..By this point Dylan was playing songs from Street Legal, which was recorded with his touring band. Unlike most of his catalog, these tracks were actually enhanced by the big band. 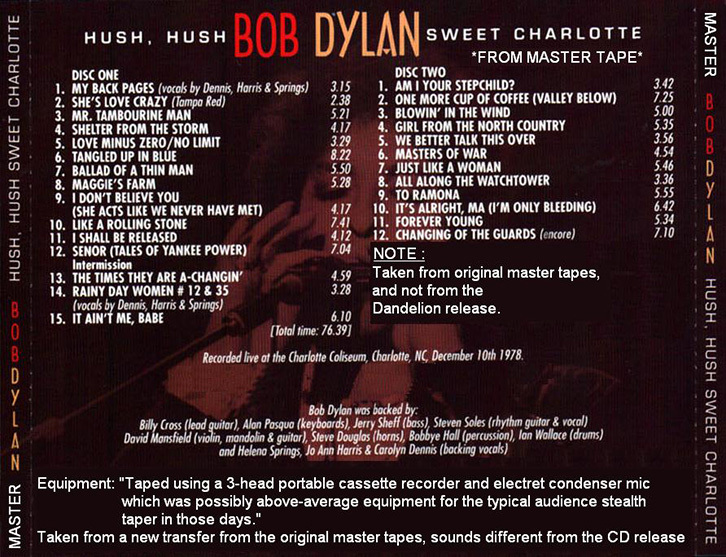 On this tape from Charlotte, Dylan is on fire as the band plays killer versions of Street Legal tracks “Señor (Tales of Yankee Power),” “We Better Talk This Over” and “Changing of the Guards.” With the exception of “Señor,” he’d play virtually nothing from the drastically underrated Street Legal over the next three decades. Thank you. You know when I was coming up in the fifties, not the sixties, but the fifties there used to be carnivals a coming through all the towns most of the towns. Every carnival had what they call a geek. I don’t know if they still have them, but they used to have what they called geeks. And a geek is a man who eats a live chicken, right before your eyes. He bites the head off an eats that. Then he continues to eat the rest of them, sweeps all the feathers up with a broom. Back then it cost a quarter to see him. Now it probably costs about 10 to 15 bucks. But by then before inflation it only cost a quarter. Anyhow, nobody would hang out too much with the geek. Nobody much. Left him alone to himself. And one day I was having breakfast with the bearded lady, she was telling me. “You know the geek he’s really funky. He’s more low-down than low-down. He doesn’t like anybody and not only does he keep to himself, but he considers everybody else as being very strange an very freaky.” I said, “hmmm hmmm”. Later on, as I was traveling around making my money, it came back to me at a certain point in time, and I put it into this particular song. All right thank you, thank you. I was invited to play at the Newport Folk Festival sometime back then. Anyway, I went to play this here song and they booted me out of town for doing it. They got all upset. It’s hard to believe that such a song could cause such a disturbance, but it did. I was riding on a train one time from Durango, Mexico to San Diego. I fell asleep on the train and woke up in this town called Monterey. And there was, I guess it was about past midnight. Not too much happening, but just maybe around that time. And a family was getting off the train. An old man was stepping up on the platform to get up on the train. And he came down the aisle and took a seat across the aisle from me. Meantime the train was still in the station. Anyway, I was watching this whole thing through the window which was turned into a long mirror. And finally I felt a strange vibration and I had to turn to look at this man. He wasn’t wearing anything but a blanket. So I turned my head to look at him. Both his eyes were on fire, I could easily see that, and there was smoke coming out of his nostrils. I said well this is the man I had to talk to. So I turned back to look out the mirror again. I finally got up the courage to talk to him. And the train started moving an the conversation went something like this. Thank you. The three girls in the group here are gonna sing a song I wrote a few years back. They insist on singing it. They say, “Bobby you can’t sing it anymore.” So they gonna sing it for you now. Thank you. I was over in France a few years back. On the particular day that I was born it happens to be a high holy gypsy holiday. For the gypsies it’s like Christmas time. So I went over there to check it out one time. And it was everything it’s supposed to be. All the gypsies from Europe, and Hungary, Romania, England, Germany, France, Spain, all them different countries. And they all go there for a week and they party. They just party. Happens every Spring. So the first day I got there I met the king of the gypsies, that’s right. The king of the gypsies, he was a young man, but I noticed he had, 16 wives and they said 130 children. And he was quite somebody, couldn’t have been more than 35. Anyway, I’ve seen a lot of people in my time. Some of them have power and they don’t deserve it. And other people that do deserve it, don’t have it. Of all the people I’ve seen this man definitely did deserve it and he had it. So anyway, I stayed there for a week. Partied. I stayed …, longest party I ever attended. And about time to leave they said, …, I’d done everything twice, just about, in that week and I hadn’t slept for a week, so they were pretty much aware of all this. So they said, “What you want to take with you while you go?” I had to make my way out of there somehow. So I just said, seeing that I had to stay up for a week, I just needed to stay up a little bit longer. And, so I asked for one more cup of coffee for the road. And they were nice enough to put it in a bag for me. They said, “How you want it?” I said, “Black”. They gave it to me and I headed out. Thank you. Ladies and gentlemen, on the drums tonight, give him a warm hand. Ian Wallace. On the bass guitar Jerry Scheff. On the keyboards Alan Pasqua. Lead guitar Billy Cross. On the violin, mandolin, electric guitar, David Mansfield. Rhythm guitar, Steve Soles. On the tenor saxophone Steve Douglas. On the backup vocals, Jo Ann Harris, Helena Springs, Carolyn Dennis. On the conga drums, from Detroit, Miss Bobbye Hall. Thank you, all right. We gotta get out of here now. Thanks for coming out, I hope we played something right. All right. I agree with you. Best live and most unique version ever. This is certainly the BEST show of the entire year of 1978. It is my candidate for a Bootleg Series release. It sure would be f***ing awesome to hear this as a soundboard recording, which I am sure rests quietly in the Dylan vaults. I’ve been thinking the same thing. This is one of Bob’s best shows EVER . . .